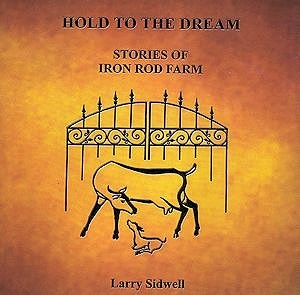 Hold to the Dream is a compilation of articles Larry submitted to the United Caprine News over a period of eleven years. Sometimes poignant, nearly always hilarious, it chronicles the adventures of a husband reluctantly following his inspired wife into goat dairying, a kind of life he had earnestly vowed to leave behind him forever. With a single-minded determination Leslie turned her initial purchase of an obscure French Alpine doe kid in 1985 into Sutra, the 1993 National Champion French Alpine, and a thriving goat cheese business just a few years later. As the stories unfold Larry shows the stresses and adjustments in their marriage to accommodate this remarkable odyssey. I do remember one evening with some degree of glee, however. We were out in the parking lot of our apartment in Virginia. We hadn't found a place to board the goats yet, so all four pregnant goats were spending their days in the trailer in the apartment complex parking lot. We were feeding and cleaning and watering them (in the dark, of course). While I was fooling with the car, Leslie disappeared, presumably to the apartment. I secured the car and noticed that the door to the trailer was left ajar. I shut the door rather irritably, since it would not have been the first time we'd hunted down escaped goats, and went to the apartment. About an hour later, wondering where my wife was, I strolled outside. I heard my name called plaintively. In a flash I knew I had looked my bride inside the mighty Mylie. I bolted down to rescue her. I was oh so apologetic and concerned, she was suitably mollified, and I uttered not a single chuckle. Well, after all, she does dote those does, right? © 2006-2014, Leslie & Larry Sidwell. All rights reserved.